Following a warning from the Centers for Disease Control and Prevention (CDC) about a salmonella outbreak linked to raw turkey, public health officials are under pressure to release the names of the turkey brands linked to the outbreak. To date, 164 people in 35 states have been infected. More than 60 people have been hospitalized and one person in California died as a result of the infection. The states most affected include Texas, Minnesota, Illinois, and New York. On Wednesday, Consumer Reports raised questions about how the USDA is handling the outbreak and pressured the agency to name the brands linked to this particular strain of salmonella. “The USDA should immediately make public which turkey producers, suppliers, and brands are involved in this outbreak — especially with Thanksgiving right around the corner,” Jean Halloran, director of Food Policy Initiatives for Consumer Reports, said in a statement. “This information could save lives and help ensure consumers take the precautions needed to prevent anyone in their home from getting sick,” Halloran said. "To be abundantly clear, FSIS has NOT identified a source or supplier of the product or products that are making consumers ill, but we continue to work around the clock with our federal and state public health partners to solve this,” the USDA said in a statement. In a warning to consumers last week, the CDC said the strain of salmonella causing the outbreak has been linked to 22 slaughterhouses and seven turkey processing facilities. No products have been recalled. Federal health officials are not advising consumers to avoid buying or eating turkey. 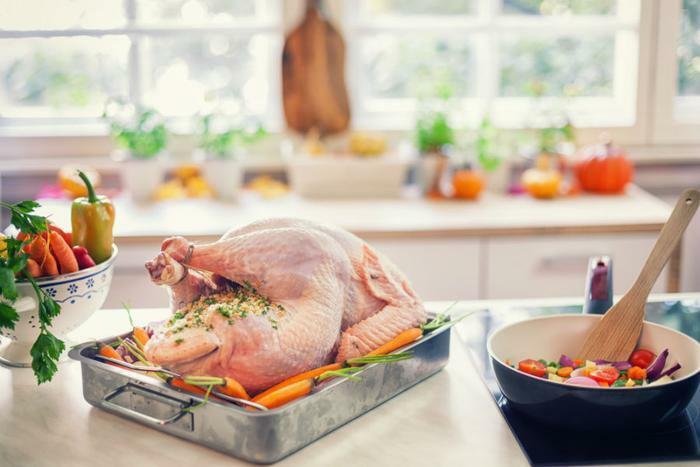 The CDC has, however, advised consumers to cook turkey thoroughly, making sure it reaches an internal temperature of at least 165 degrees Fahrenheit so that salmonella and other foodborne germs are destroyed. The agency also advises people to be sure to wash their hands before and after cooking and to clean any surfaces the raw turkey comes in contact with. “At the moment, there is no actionable information for consumers, other than to remind them that this is an ongoing investigation and that consumers should always handle raw turkey carefully and cook it thoroughly to prevent food poisoning,” the USDA said.